Garnet was an advocate of rodeo and today his memory still lives on in this Award. The Lee Bar N Rodeo Alumni is once again honoured to present this buckle on behalf of a great man and cowboy, Garnet Patrick. 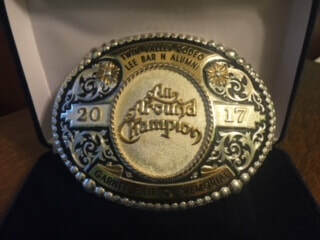 Lee Bar N Rodeo Alumni is Les Lee, Bob Bennett, Donald Helmeczi, Brian Kacsmar, Greg Kacsmar, Laurie Kacsmar, Trevor Nicholauson, & Kelly Oremba.